May 1861, and the newly created state of Italy was in turmoil. The country remained a loose coalition of territories. Rome had been declared as the capital a few months before, but not everyone was playing ball. 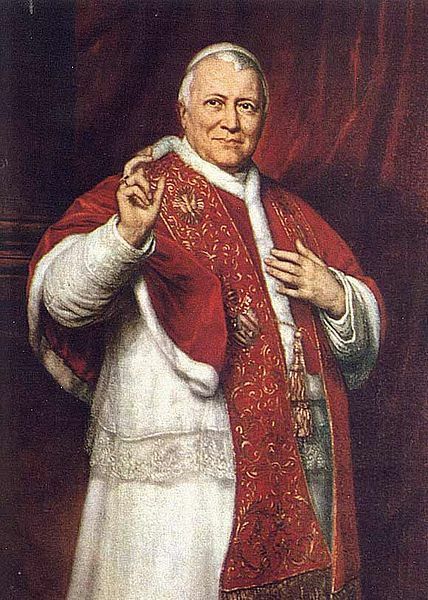 In particular, Pope Pius IX remained strongly opposed to Italian nationalism. A French garrison was stationed in Rome, protecting the Pope and impeding the new government from taking its seat. The situation was tense. No one knew which way the wind would blow. The chattering classes speculated about the Pope resigning (unprecedented for centuries!) to diffuse the situation. Some even suggested he could be removed by force. With the situation unstable, all kinds of rumours began to circulate. One extraordinary possibility was that the Pontiff, or at least his powers, might transfer overseas, and perhaps to Britain. Could the world centre of Catholicism move from the ancient imperial capital of Rome to the modern Imperial capital of London? This unlikely possibility was first aired in the 20 April edition of Brussels newspaper L'Independance Belge, and was swiftly picked up by the British press (a scan can be viewed here). The following excerpt, quoting an unnamed correspondent in Paris, is from the Glasgow Herald, but similar text was syndicated to many newspapers. "I am assured that the Holy Father has already, some months ago, made all the arrangements in the event of his death, in the event of his deposition, or even in the event of voluntary abdication...By a decision approved of by 21 Cardinals, Pius IX is said to have nominated as his successor or his representative, until the regular election of a new Pope...Cardinal Wiseman, Primate of England...[He] would thus become invested with all Papal powers, especially with that of summoning at London a great Œcumenical council." "That England should thus be chosen as the moral refuge of Catholicism — as the harbour into which St Peter's bark runs for safety amidst storms, is certainly quite unexpected." And, quite possibly, untrue. The story seems to vanish from view after this, mentioned only in refutation by the British Government, a note in Hansard, and as a denial from the French source. While Pius IX apparently made regular noises about seeking political sanctuary overseas, he remained in office and in Italy until 1878, describing himself as 'the prisoner in the Vatican' after nationalist forces eventually gained control of Rome. Where the rumour came from, and whether there was any truth to it, we've not had time to research, but we'd welcome comment from anyone who's studied this period.